Little Farm in the Foothills: New Irish Book and a Freebie! New Irish Book and a Freebie! Two friends search for their heart’s desire in this small-town romantic story set in Ireland. Kerry has fallen in love all over again with her husband Stephen, and after their miscarriage, she longs to try for another baby. But will her lifelong quest of having a farm bring an end to her marriage? This novel is the sequel to Book 3, The Hopeful Romantic, with a new Ballydara heroine. It's no coincidence that many of Kerry's farm adventures in The Galway Girls have been inspired by my real-life experiences on my little farm. 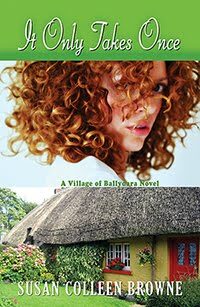 And if you haven't yet tried the Ballydara stories, you might take a look at It Only Takes Once, Book 1 of the series, about single motherhood, first love, and second chances...it's now free on Amazon, Kobo, and at all other online stores!